To see more details and to purchase, click the image above. 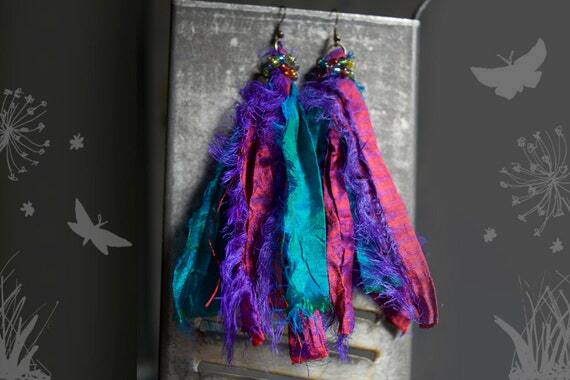 Brown sari silk wrapped with peridot colored wire, purple and blue faceted mirrored glass beads. Topped with an antiqued bronze finish steel filigree. 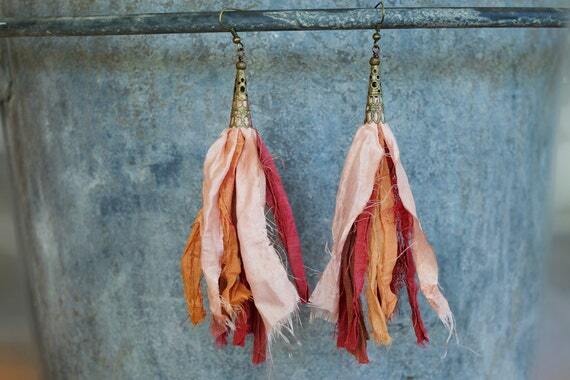 The sari silk comes from cottage industry workers in India who use leftovers from manufacturing to earn a living. Chiffon sari silk in a lively green with a wrap of amethyst colored craft wire add a punch of color and style to your look. 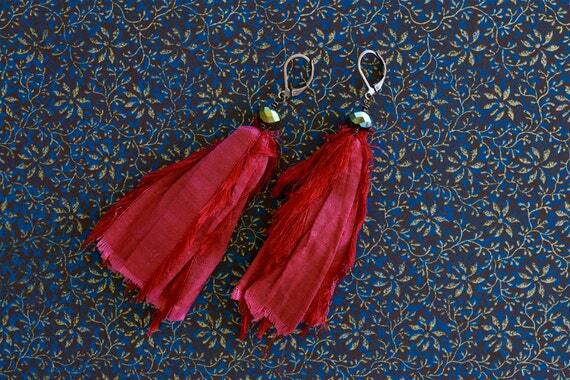 They go well with hippie, boho, gypsy and whimsical attire. Gunmetal finish steel kidney ear wires complete the look. 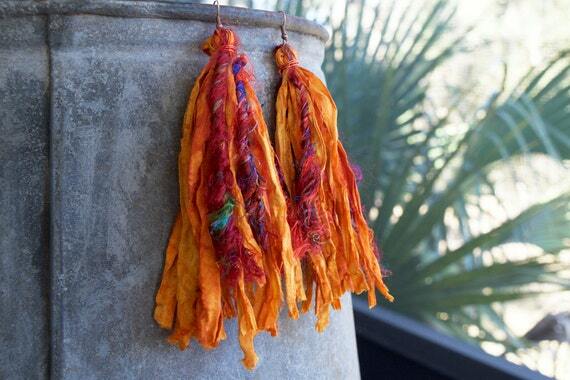 These shoulder duster earrings feature bright orange sari silk ribbon and multicolor sari silk yarn. The sari silk comes from cottage industry workers in India who use leftovers from manufacturing to earn a living. The ear wires are steel with an antiqued copper finish. I rounded the tips for your comfort and safety. 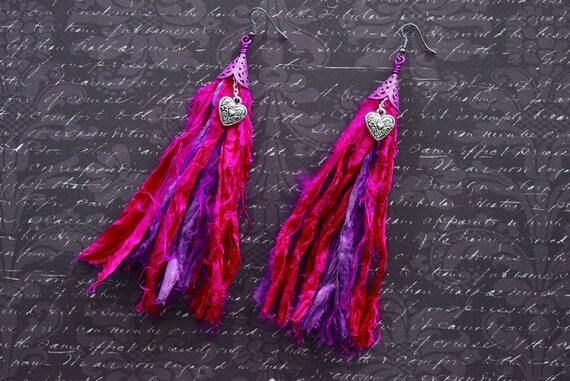 If you love colors you'll adore these bright and bold fuscia and purple sari silk shoulder duster earrings I made. They have a sweet silvertone heart and hand painted (by me!) cone filigree caps. 6 1/4" long from the top of the ear wires; flare out about 2". They weigh about 1/10 ounce each. 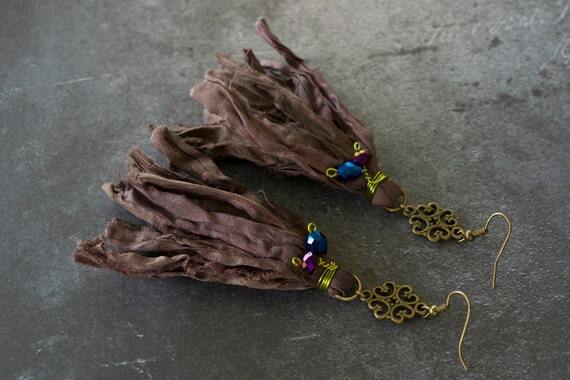 These boho gypsy style earrings are 4 1/4" long from the top of the ear wire. 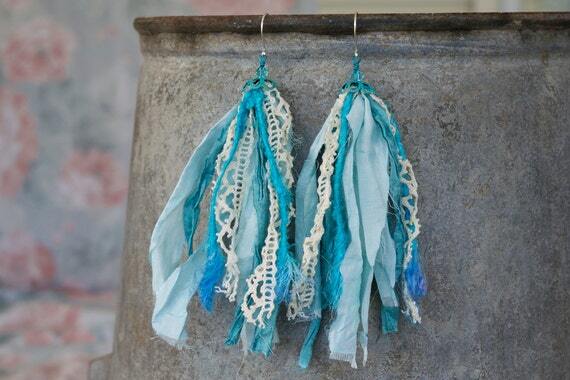 The sari silk ribbon comes from cottage industry workers in India who use leftovers from manufacturing to earn a living. The upcycled silk comes from an item I purchased from a local hospice thrift shop. 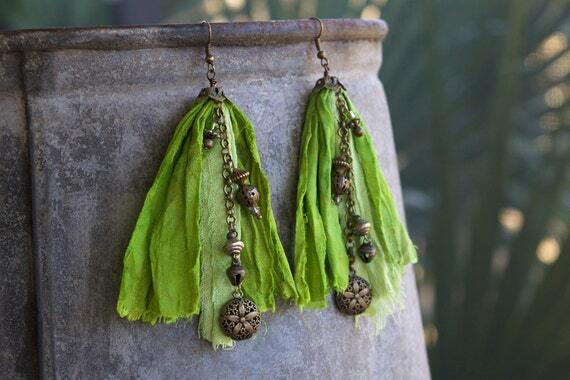 I hand painted a green distressed finish on the bead cap and added a dangle of chain, glass and metal beads. They each have a small bell and a lovely filigree flower bead at the bottom. Surprisingly lightweight at only 1/10 ounce each! 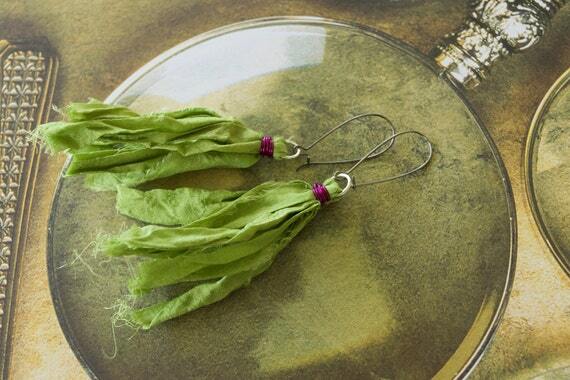 These fanciful earrings feature fair trade sari silk. It comes from cottage industry workers in India who use leftovers from manufacturing to earn a living. I fashioned the ear wires from silver plate wire that has a protective coating to help prevent tarnish. I smoothed the tips for your comfort and safety. Lightweight: less than 1/10 ounce each! 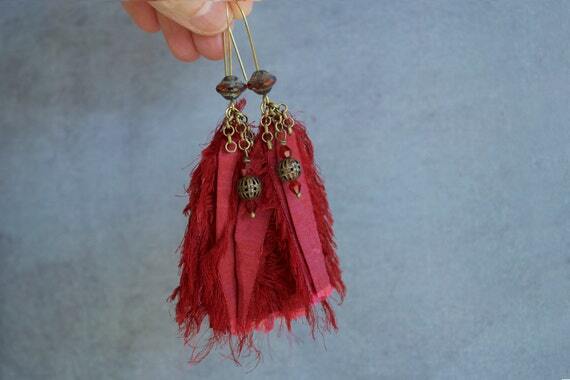 Topped with filigree cones, these sari silk earrings in warm colors go well with gypsy, boho, tribal and hippie styles, or just your everyday casual wear. The sari silk ribbon comes from cottage industry workers in India who use leftovers from manufacturing to earn a living. A Czech glass Saturn bead with a faceted edge and two red bicone faceted glass beads add extra sparkle. I fashioned the ear wires from solid unfinished brass, wire, angled the tops and lightly hammered the front edges. I smoothed the tips of the ear wires for your comfort and safety. Lightweight - less than 1/10 ounce each! 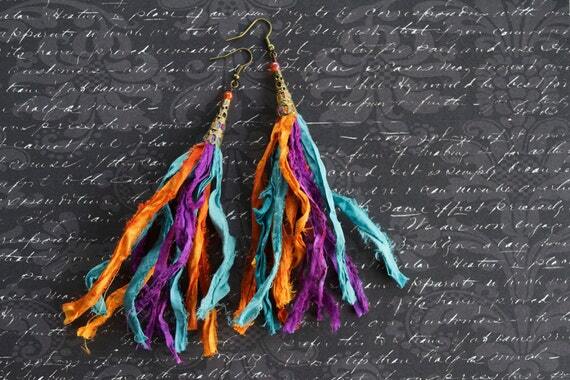 I named these earrings "Carnival" because they're so colorful and fun. If sold, I can make more.